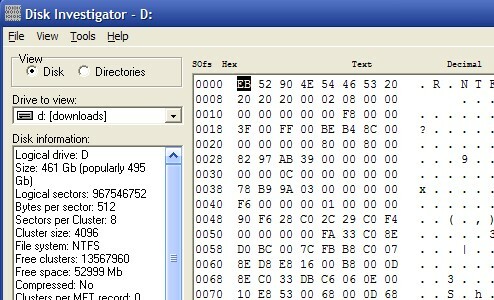 Windows only: Disk Investigator takes a different approach than many data retrieval tools by examining the raw data on the disk. Using the tool is enormously more intensive than a casual Windows search or even using an indexer like Google Desktop. Searching for a string like "password" will reveal every single instance of the word throughout the entire disk inside code, help files, documents, where ever it may be found. If you're at your wits end trying to recover a deleted file or mine the depths of your computer for something that is stubbornly resisting being found, if it exists there is a strong chance Disk Investigator will turn it up. During my testing of the application, I was rather impressed with just how much it found. Every search I came up with short of Purple Bearded Break Dancing Dragons found hundreds to thousands of instances. I'm sure had I ever actually typed that prior to this moment in time it would have found that too. Whether you need to find lost things or verify that the things you deleted will stay deleted, Disk Investigator is a powerful tool. Disk Investigator is freeware, Windows only.